Pakistan’s student movement that produced luminaries such as Dr. Mohammad Sarwar, Dr. Syed Haroon Ahmed, Dr. Adib-ul-Hasan Rizvi, Dr. Jaffar Naqvi, Mohammad Kazim, Abid Hasan Minto, Sher Afzal Malik, Husain Naqi, Johar Husain, Fatehyab Ali Khan and Meiraj Mohammad Khan, to name a few, has a glorious history. In its long journey it faced extreme hardship and can be characterized by at least two milestones: January 7, 1953 movement that enabled the students of Karachi to have a University and better educational facilities, and led to the 1968-69 student movement that forced military dictator Gen. Ayub Khan to announce he would not take part in next elections. The population of Karachi in 1941 was merely 386,655, according to Rustomji and Katrak, authors of “Karachi During The British Raj.” Amongst them, 180,199 were Hindus; and 162,447 were Muslims. The Hindu majority was diluted with the influx of immigrants from India after the creation of Pakistan in August 1947, and the migration of Hindus the other way drastically changed the demography of Karachi. Eminent architect and town planner Arif Hasan notes in his book, “The Unplanned Revolution” that major changes took place in Karachi between 1947 and 1951 with the addition of over six hundred thousand inhabitants to the city’s population. “The Hindu population decreased from fifty-one per cent to two per cent, while the Muslim population increased to ninety-six per cent. Similarly, the Sindhi-speaking population decreased from 61.2 per cent to 8.6 per cent, while the Urdu/Hindi-speaking population increased from 6.3 per cent to fifty per cent,” he points out. It was in this perspective that Democratic Students Federation (DSF), a progressive students’ organisation was established in 1950 and Mohammad Sarwar was elected its convener. “DSF drew up a ‘Charter of Demands’ including issues like tuition fees and library facilities. We decided to hold ‘Demands Day’ on January 7, 1953, and meet the education minister, Fazlur Rehman. The administration blocked the protest, resorted to lathi charge, tear gas and arrested the leaders. Meanwhile, another students’ group, the ‘World University Service,’ led by Qamar-uz-Zaman and patronised by the Vice Chancellor of Karachi University A.B.A. Haleem met Fazlur Rehman and announced that all the students’ demands had been met,” according to an article written jointly by S. Haroon Ahmed and Saleem Asmi and published in daily Dawn on April 5, 2008. Police barricaded the area around DJ Science College where 5-6,000 students had convened for Demands Day. Students, infuriated by the gimmicks of establishment, charged out of the college compound, despite the police tear gas and lathi-charge. Many hundreds of students managed to reach the Education Minister’s residence only to find him unavailable. Police arrested some of the leadership but had to release them under pressure as hundreds of students who refused to move from the spot. The released leaders immediately announced another rally the next day. This too was a peaceful protest but with twice the number of participants in protest at the police brutality of the previous day. Police firing upon students near Paradise Cinema in Saddar took the lives of at least six students and a passerby. The ugly incident brought a sharp reaction from the student community and infuriated the common man in the city as elsewhere. (According to Students’ Herald, eight students were killed and several passers-by, with a total of 27 killed over three days, Jan 7-9, 1953). But the government had already decided to become protégé of US imperialism. Following the Baghdad Pact of 1954, it banned DSF along with the fragile Communist Party of Pakistan (CPP) and Progressive Writers’ Association (PWA). The ban was followed by mass arrests, including the arrest of Mohammad Sarwar. He received his final year MBBS results while in prison, according to Dr. Ahmed. The ban did not deter the students and they re-converged under the umbrella of National Students Federation (NSF) that happened to be a small, right-wing organization but underwent a metamorphosis after progressive students joined it en masse. Since then students under the leadership of NSF celebrated January 8 as “Martyrs Day” year after year until it withered away in the 1980s due to a host of reasons. These included state repression, infiltration of intelligence agencies in its rank and file, a myopic policy pursued by underground communist factions that indulged in what Lenin described as “left wing communism-an infantile disorder,” division in the international communist movement etc. However, the momentum of January 7, 1953 movement under the dynamic leadership of Mohammad Sarwar gave impetus to student upsurges in 1962, 1964, and 1968-69. In 1964 elections held under the notorious Basic Democracy system in which only 80,000 voters were allowed to vote, NSF played a vital role in mobilizing the masses for Mohtarama Fatima Jinnah who had challenged military dictator Gen. Ayub Khan. She lost the elections but her dynamic leadership did play a role in the weakening of despotic rule. 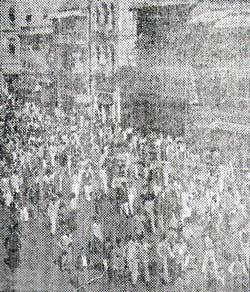 Weakened further by the 17-day 1965 Indo-Pak war and facing acute economic problems prompted the students of Karachi under the leadership of NSF to observe a “Demands Week” in 1968 and within no time it was joined by industrial workers, teachers, lawyers, doctors and other professionals. 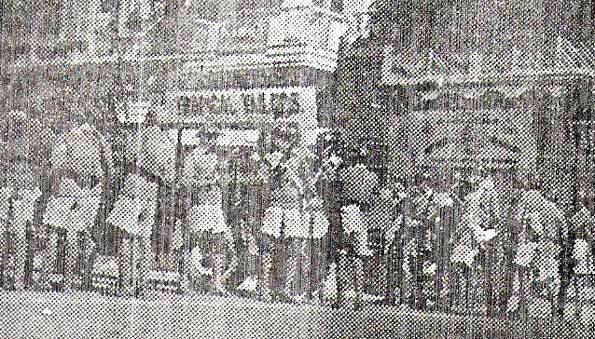 The strength of NSF at that time could be gauged by the fact that Karachi was completely shut down when teachers staged a hunger strike in front of Sir Syed Girls College in Karachi and even the cricket match between Pakistan and Commonwealth team was disrupted at the National Stadium, Karachi. The students had graduated. They were struggling not only for better education facilities but for political demands as well. And it was a global phenomenon. Winds of change were blowing across the world and the heroic struggle of Vietnamese people against US imperialism was a source of inspiration for everybody. The democratic upsurge of 1968-69 forced Ayub to announce that he would not take part in next elections. It was no doubt a big victory. It was time of revolution in Pakistan but the establishment was not ready to succumb so easily. Hence Gen. Agha Mohammad Yaha Khan usurped power to safeguard the interests of elite forces. No wonder the elitist forces also rejected the outcome of 1970 elections and instead initiated a genocide in former East Pakistan (now Bangladesh), culminating in the dismemberment of Pakistan. There was euphoria when Pakistan People’s Party founding chairman, Zulfiqar Ali Bhutto took the reins of power in “new Pakistan” in 1972. But it soon evaporated in thin air when a reign of terror was let loose against progressive students and industrial workers. Sadly enough erosion of progressive student and trade union movement begun in the era of one of our most populist political leader Z.A. Bhutto and culminated during the more despotic rule of Gen. Ziaul Haq amid introduction of drug and arms culture in the wake of previous Afghan War. The progressive student movement withered away and was replaced by ethnic and fascist organizations. But undercurrents never die. Today, when we are poised to once again commemorate January 7, 1953 movement the legacy of Dr. Mohammad Sarwar is very much alive and veterans have come out of hibernation. Let’s hope the grand event at Arts Council Karachi on January 9 and the roundtable discussion on Jan 10 will pave the way for the reincarnation of Pakistan’s glorious student movement that made headlines in 1953 as well as in 1968-69. Societies degenerate but there is always the process of regeneration.